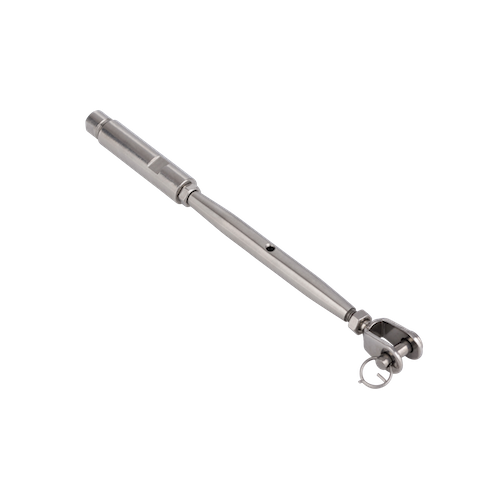 A Jaw/Swageless Bottlescrew consists of one (1) AISI 316 marine grade stainless steel Threaded Jaw, also known as Threaded Fork, and one (1) AISI 316 grade stainless steel Blue Wave Swageless Terminal. Using the swageless terminal prevents the need for onsite swaging tools or factory swaging. Miami Stainless Threaded Forks are cast AISI 316 marine grade stainless steel with forged AISI 316 marine grade stainless steel pins and are designed to attach to a wide range of fixtures and fittings.